Rick Holmes and the SWC Detention Solutions team had a very busy 2013 securing several large security integrations projects including the new Fulton County Detention Center in Fulton County Arkansas. The jail is a new state of the art facility set to open in December 2013. The SWC team has been hard at work installing a completely integrated detention solution including Computer Control Stations, Programmable Logic Controllers, Intercommunications and a Closed Circuit Television System. 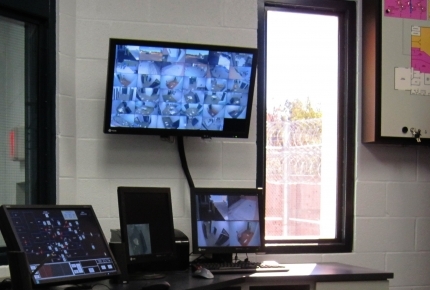 The CCTV system includes 35 cameras which cover every inch both in and outside the jail. The cameras located outside the jail have full pan/tilt/zoom functionality, allowing for complete visibility of the jail perimeter from inside the control room. Many local residents recently toured the facility on November 3, 2013 during the Fulton County Detention Center open house. Visitors we’re impressed with the security solutions SWC installed such as flat screen monitors displaying every jail cell. Read local coverage about the new Fulton County Detention Center.